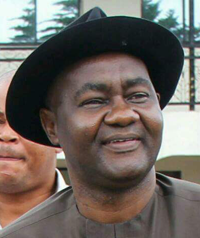 ABUJA—SENATOR Magnus Abe, representing Rivers South East, has asked President Muhammadu Buhari to compel members of the party to obey court orders if the future of the party must be guaranteed, especially ahead of 2019 presidential and general elections. The Rivers State serving senator and governorship hopeful of All Progressives Congress, APC, who addressed journalists yesterday in Abuja, bemoaned a situation where the party defied a court order, warning that the actions of the Minister of Transportation, Mr Chibuike Ameachi, will jeopardize Buhari’s re-election bid if the present crisis was not nipped in the bud. This came as the Chief Justice of Nigeria, CJN, Justice Walter Onnoghen, yesterday, said that the recent attack on the Rivers State High Court sitting in Port Harcourt was an indication that democracy in Nigeria is under threat. Noting that the attack took place as judges, magistrates, staff and lawyers reported for duty, Justice Onnoghen said such “show of shame” should not be encouraged by right thinking members of the Nigerian public. A statement by his media aide, Mr. Awassam Bassey, said: “Justice Onnoghen, has been informed of an attack on the Port Harcourt High Court complex on May 11, 2018. According to the reports, judicial and non-judicial staff were denied access to the complex as all the gates were padlocked and the buildings surrounded by hoodlums. “These hoodlums, who were said to be heavily armed, reportedly inflicted bodily harm to judicial officers and other staff of the judiciary going about their lawful duties and destroyed some properties belonging to the judiciary. This action was aimed at stopping the court from sitting and delivering a ruling in an intra-party dispute of the APC in respect of the local government congresses of the party in the state. “This latest act of intimidation of the judiciary and the unwarranted violence against a peaceful institution of an arm of government is quite disturbing. More importantly, such show of shame ought not to be encouraged by right thinking members of the Nigerian Public. Meanwhile, Senator Abe flanked at the briefing by Senator Wilson Ake, Chidi Wihioka, representing Ikwerre/ Emohua Federal Constituency and Maurice Pronen, Khana/ Gokana Federal Constituency, said that it was clear that the APC had reached a point where it must take a decision either to live up to the core values of President Buhari and do the right thing or abandon the values and destroy the soul in order to please man. Meanwhile, Senator Abe flanked at the briefing by Senator Wilson Ake, Chidi Wihioka, representing Ikwerre/ Emohua Federal Constituency and Maurice Pronen, Khana/ Gokana Federal Constituency, said that it was clear that the APC had reached a point where it must take a decision either to live up to the core values of President Buhari and do the right thing or abandon the values and destroy the soul in other to please man. Senator Abe had, on Friday, secured an injunction stopping the conduct of the LGA congress in the state. The development had ruptured peace in the state as Peoples Democratic Party, PDP and APC supporters clashed, leading to a temporary closure of the Rivers State High Court. Speaking further yesterday, Senator Abe said, “The APC must distance itself from the show of shame going on Rivers State. I have decided to address you because it has become clear the that my party, the APC has reached a point where it must take a decision either to live up to the core values of our leader President Buhari and do the right thing or abandon our values and destroy our soul in other to please man. “The South South caucus of the party had met at the home of the Minister of Transportation in Abuja and directed that certain steps be taken by the leaders in the states to build confidence in the process before the congresses should begin. First it was agreed that an all inclusive meeting be called between Thursday and Friday preceding the ward congresses, The meeting was to include all tendencies in the party and the modalities for congresses be discussed and agreed upon, it was also directed that the congress committee from Abuja should equally meet with all stakeholders on arrival and be briefed on the arrangements and agreements already reached in the state. “Non of this was done in Rivers State rather a faction of the party lead the Minister proceeded with the exercise in total disdain of the rights and privileges of other members. Party members who paid money to the party were blatantly disenfranchised. All protest and appeals fell on deaf ears. After the purported failed exercise. “Another South South caucus meeting was called this time at the home of State for Minister of Petroleum and it was agreed that the rules were not followed in Rivers State and the exercise in Rivers State was not acceptable. However, in other states were such conclusions were reached the caucus gave clear directives on what should be done to remedy the situation before the local government congress. In the case of Rivers State however, it was decided that because it is the home state of the president’s DG of campaign the President should be briefed before any further action can be taken. “We all knew of the Presidents planned travel and the local government congresses were set to proceed using the flawed ward congresses as a base. At that point it became clear that all internal conflict resolution processes within the party had been compromised at the altar of individual power.